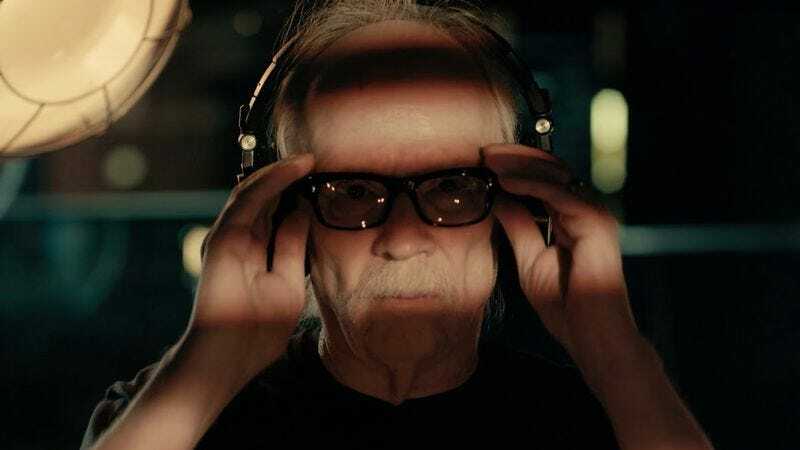 Horror master John Carpenter will be embarking on a world tour in less than a month to promote his latest album of original music, Lost Themes II. But before that happens, Carpenter and his touring band—consisting of son Cody, godson Dave Davies, and Grammy-winning musicians John Spiker, John Konesky, and Scott Seiver—are passing the time by re-recording the themes to a few of the director’s most popular films. Today, Sacred Bones records released a music video featuring J.C. and the band performing the theme from the director’s 1981 cult classic, Escape From New York. It’s worth noting that the video was directed by John Carpenter himself, who hasn’t taken a directing credit since 2010’s The Ward. The video simply shows the band doing what they do—playing music—in what it can be assumed is the home studio where Carpenter recorded the Lost Themes records. The re-recording brings a new urgency to Snake Plissken’s Western-influenced theme, with rich synthesizers and soaring guitar lines. Doing double duty directing and hammering out notes on lead synthesizer, Carpenter looks right at home, and viewers will get a sense of joy as he smiles, playing along with his son. The “Halloween” b/w “Escape From New York” 12-inch, as well as “Assault On Precinct 13” b/w “The Fog,” are available for pre-order with a street date of June 17. For those who aren’t into outdated technologies, the four tunes will also be available as the Classic Themes Redux EP on iTunes.